This property is directly associated with the initial period (1902-1920) of downtown commercial expansion that occurred due to local economic prosperity after the Klondike Gold Rush and in tandem with explosive population growth and suburban neighborhood development. During this era, modern downtown urban scale began with the construction of the earliest steel-frame highrise buildings and the establishment of a concentration of banking enterprises and department stores along Second Avenue from Cherry Street to Pike Street. The initial regrading of Denny Hill and the commercial redevelopment of the former University Grounds (University/Metropolitan Tract) were major factors that facilitated northward and eastward commercial expansion. In 1914, the owners of the Frederick and Nelson Department Store purchased property with the intention of building a large, five-story store at Fifth Avenue and Pine Street, thus solidifying the location of the future downtown retail core. A significant number of extant commercial properties dating from this era remain within the downtown commercial core, including: numerous hotels, banks, business blocks and early highrise commercial buildings, as well as some specialty and department stores, clubhouses, apartment houses and theaters. After the turn of the century, local and regional economic prosperity generated the earliest construction of tall, steel-frame and ferroconcrete office buildings at the northern edge of the commercial district along Second Avenue. The 14-story Alaska Building (1903-04), the 12-story American Savings Bank/Empire Building (1904-06, destroyed), and the not fully realized 12-story Mehlorn Building (1906-07) were constructed exhibiting elegant brick and terra cotta cladding and ornament in a design mode heavily influenced by eastern precedents, especially the Chicago School. As compared with typical masonry-bearing wall construction, steel-frame construction allowed for both greater height and greater flexibility in office layout. Thus, these modern buildings could accommodate a wider variety and number of tenants. Distinctive early skyscrapers of similar scale, construction technology and design character – as well as more modest commercial blocks - would be constructed elsewhere in the expanding commercial core over the subsequent ten years, including: the Eitel Building (1906); Northern Bank and Trust Company Building (1906-09); the Central Building (1907); the White Building (1908, destroyed), the Henry Building (1909, destroyed), Cobb Building (1909); and the eighteen-story Hoge Building (1911) and at the far north end of the expanding commercial district the Securities Building (1913). This only partially completed early highrise office building was designed by James H. Schack for August Mehlorn, Esq. The exquisite original design was fully delineated on 43 sheets of ink drawings on linen that include floor plans, exterior elevations and elaborate exterior and interior details. In early August 1906 the Seattle PI reported on the “New Skyscraper to be Erected on Second Avenue by August Melhorn (sic)” and briefly described James H. Schack’s plans for the twelve-story, fireproof, steel and concrete office building. The article acknowledged that the initial construction contract would be let for only the “first five floors and the basement” and implied that the entire tall structure would be completed in a separate construction phase. The article was accompanied by a full rendering of the Second Avenue façade and the south elevation – showing the planned office building towering above the adjacent Marion Building to the north and Seattle National Bank to the south. In mid-September 1906 the Seattle PI reported on the shortage of suitable office space in “good” buildings and noted that progress on the completion of the twelve-story American Savings Bank/Empire Building and the new Mehlorn Building would eventually help relieve the situation. In early June 1907, the Seattle PI reported on the progress of several modern buildings that were currently under construction in the “business district” including: the “enormous” Central Building on Third Avenue; the Moore Theater and Hotel nearing competition at Second Avenue and Virginia Street; the Chapin Building at the SE corner of Second Avenue and Pike Street the Baillargeon Store Building at Second Avenue and Spring Street, and the “rushed completion” of the first five floors of the Mehlorn Building. The article also noted that the interior work on the top nine floors of the American Savings Bank/Empire Building was proceeding. It is not known what specific circumstances may have occurred that the construction of the planned additional upper floor levels was not undertaken. The cost of the anticipated full construction may have proved to be too great in conjunction with the subsequent construction of a significant number of other highrise buildings and large commercial blocks over the following few years, which may have diminished the market for office space. Biographical information regarding Mr. Mehlorn has yet to be obtained; such information could clarify his financial backing or the lack of it. Several other buildings that were constructed during this era with only partially realized original designs, including: the Central Building; Baillargeon Store Building; Securities Building; the County-City Building (King County Courthouse); Rector/Governor Hotel (St. Charles Hotel) and the YWCA Building. By 1933 the property was in the ownership of the Eight-Fourteen Corporation. The 1937 property tax card notes that the building included “64 rooms” or office spaces, shows the “814 Second Avenue Building” sign in place and that the two storefront spaces were for rent, and that the upper floor levels included offices for John R. Holmes, Real Estate Co., the Centennial Flour Mills and the Matson Navigation Company. 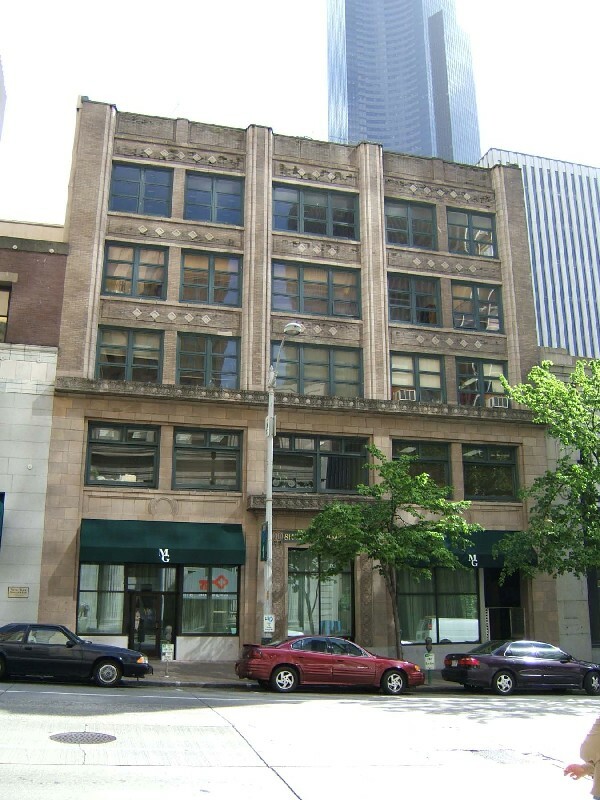 In 1963, this building and the adjacent Marion Building were both acquired by Seattle Trust and Savings Bank (804 Second Avenue Corp.), which was headquartered in the adjacent bank building to the south. In the early 1980s, the Marion Building and Mehlorn Building were rehabilitated and adapted for restaurant use. After arriving in Seattle in 1901, James H. Schack (1871-1933) initially practiced independently for a brief period during which he designed this exquisite but only partially constructed early highrise office building. He practiced in a brief partnership with Daniel R. Huntington from 1907 to 1909 during which the firm designed the First United Methodist Church (1907-10) and the Hotel Morrison (Arctic Club, 1908-09). Schack is known to have designed commercial buildings, hotels and residences prior to beginning to collaborate with David John Myers (1872-1936) in 1917. Schack appears to have been individually responsible for the design of this garage building, which was constructed shortly before he and Myers formed a partnership with engineer Arrigo M. Young (1884-1954) and established the notable Seattle architecture firm of Schack, Young and Myers. Schack, Young and Myers were a prolific firm credited with numerous major commercial, residential and institutional commissions during the 1920s. The firm evolved to become The Richardson Associates (TRA) by the 1970s. Other early transportation and auto-related facilities credited to the firm or its partners include the Sunset Motor Car dealership, (Myers, 1917-18, destroyed) and the conversion of the vacant Grand Opera House into a garage facility (1923). While the exterior of this building is a relatively intact, the building exhibits a rather truncated and awkward appearance due the fact that the original design was never realized. As built, it is questionable whether it conveys historic and/or architectural significance. Located mid-block on the east side of Second Avenue between Columbia and Marion Streets, this five -story building was constructed as the first phase of a planned 12-story office building. It is I-shaped in plan with an overall footprint including lightwells of 60’ x 108’ and includes a reinforced concrete foundation and basement. Because the planned three-part vertical block shaft and building cap were never completed the building exhibits an odd two-part vertical block façade composition. The base of the building incorporates fine Sullivanesque architectural detailing indicative of the original architectural intention. The brick masonry and reinforced concrete structure is clad with buff color brick, cast stone (with subtle stone finish highlights) and granite. The exterior is divided horizontally by an intermediate cornice and exhibits a distinctive but altered two-story base. The stunted three-story shaft is clad with brick and divided into three bays with raised piers and recessed spandrels, which enframe sets of windows. The piers are ribbed with cast stone trim and the brick spandrels are decorated with diamond-patterned ornament. There is no cornice or building cap, the piers terminate in an abrupt manner at a low undecorated parapet wall. The distinctive two-story base is divided into corresponding storefront level and second floor window openings. The base is clad with a smooth cast stone product. A prominent intermediate cornice is located above the second floor windows. The face of the cornice is decorated with intricate ornament utilizing foliage motifs drawn from Sullivaneque precedents. This same ornament decorates the face of a square cornice that accentuates the central doorway opening. Additional intricate ornament utilizing circular foliage motifs also drawn from Sullivaneque precedents is applied to the entry doorway surround and the corner blocks include “AD” and “06” in a similar ornate treatment. All of the existing windows are a modern aluminum window product and are dissimilar to the original windows. All of the storefront openings have been altered, including the ornate central entry door that has been infilled and converted to a window opening. Modern canvas awnings and a second entry doorway have also been added. There do not appear to be any remaining intact or architecturally significant interior building features, finishes or public spaces. "New Skyscraper to be Erected on Second Avenue" Seattle P. I. August 5, 1906.